I thought I was going to sail through menopause. I had zero perimenopause symptoms and it wasn’t until a full year after menopause that I began having issues. But, then 2014 was a year of physical change for me. I put on ten pounds in two months and I couldn’t lose it. I was always the slowest runner ever and then suddenly, I couldn’t run at all without feeling like I was running through mud and my heart rate skyrocketing up to dangerous levels. My teeth hurt. I couldn’t sleep. And, finally — a full year after menopause — I started having hot flashes. I really thought that I, alone, would miss out on those. I was lucky. Did you see the recent New York Times article about how hot flashes can last as long as 14 years? For two-thirds of women, hot flashes begin in perimenopause. And the earlier they start, the longer they can last. Figures. Accept that your body has changed and is changing and that you need to get to know it again. I never really did well on formal “diets” in my former life. If I needed to lose weight, I increased my running – a lot – and just generally cut back on what I ate. All of the sudden, that wasn’t working. And neither was low carb, intermittent fasting, strict calorie counting, you name it. I kept plugging away, but I wasn’t patient or kind with myself. I should have cut myself some slack and if you’re going through this, you should be too. Accept that change is stressful. I’m waking up every morning feeling like I’ve been run over by a bus and like I got 20 minutes of sleep and I’m still beating myself up because I didn’t get up early to exercise? I should have just accepted that I needed to be gentle with my body and dealt with one problem at a time. Buy pretty clothes in your size. I waited too long to do this. I don’t care if you do spend $200 on clothes “you will only wear for a month”. You deserve to feel pretty for that month. I’ve felt so much better about myself when I finally accepted that this was my size and I could still wear pretty clothes. Eat good food that’s nutritious and tastes good. And enjoy what you eat! It seems more important than ever to put good food in my body and that means not getting by on coffee and cookies like I did in my 20s, but it also means actually feeding my body and not starving it. I see so many women at my office making meals out cereal bars and it makes me sad. If a cereal bar does it for you, that’s great, but if you’re going to be hungry an hour later, then feed your body something that satisfies it and tells it thanks for being there for you. People always talk about how it only takes 200 extra calories a day and at the end of the year you’ve gained an extra 10 pounds or something. But that works in reverse as well – just cutting down a barely noticeable bit or moving just a little bit more can also add up. Be Kind to Yourself. When things are changing, it’s time to hold on, I think, and not put yourself under additional stress. Just as in previous changes: puberty, pregnancy, etc., things will settle down and that’s the time to assess and move on. While the changes are happening, let’s all just be good to ourselves and get plenty of rest. You speak loads of truth in this post!! I did that way too long Jodie and you’re so right, it makes me feel so much better about myself to see myself in pretty clothes. It’s great to have you back, Katy! You impart some great advice…I was one of the relatively lucky ones in terms of hot flashes (they subsided after just a few years, and were always fairly intermittent). The weight gain and inability to lose it easily really is frustrating, but we really do need to cut ourselves some slack. As long as we eat healthfully, keep moving and treat our bodies with love and care, well, isn’t that what it’s all about? We’ve come too far in this life to live in deprivation! So true, Roxanne. I look at those Oprah Weight Watchers commercials and wish she would just cut herself a break and enjoy life. 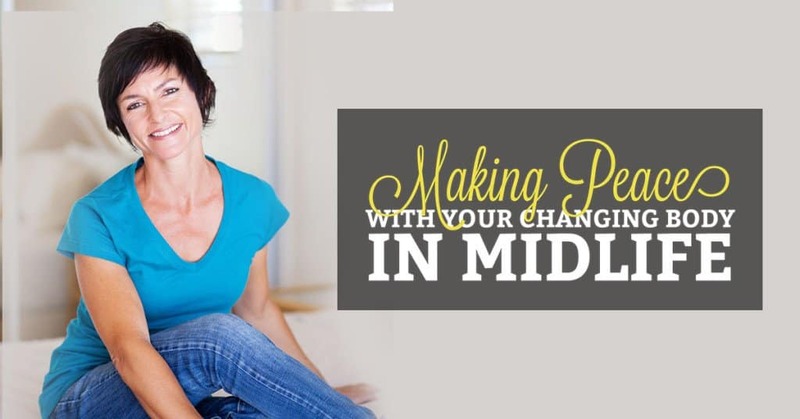 Yes, lots of unexpected changes during menopause. I’ve been lucky with the hot flashes, but not so much in other areas. I think menopause kicked my thyroid to the curb. But it’s better now. I am a big believer in supplements too….and B-12 supplements help me with energy. Fruit has been helping me too. I’ve heard great things about b12 supplements. I’ll have to give them a try! I think I had hot flashes for 10 years… and I always could lose a couple pounds by just eating better for a few days…I can eat better, exercise, walk a few miles and actually put on weight now…but I keep doing all of it anyway…I am embracing my new 60something body, but its a little harder to embrace these days…good luck! Oh my gosh, that’s so true. Yes, mine have lasted for ages it seems. I love all of your bullet points. Accepting things you really cannot change is so very important. Fortunately, there are some things we can do to help us along this road. I really appreciate posts like yours that continue to bring us awareness. Love what you said about buying clothes, Katy. I started doing that and feel much better about myself, rather than waiting to lose the weight I’ve put on. Sharing your post. So many women need to read this. Thanks Corinne! You’re so right – we all deserve pretty clothes! It is so great to read your posts-they provide extra affirmation or confirmation that the thoughts, fears, and changes I am going through at my age are shared by others. Thanks Katy! My self image has been tied to the way I look for most of my life, but I am finally understanding there is way more to me than my extra pounds. I have decided to eat healthy, but eat what I want, stop when I get full, and exercise every day. I will not go on a formal diet an longer! I still have hot flashes, and unfortunately they usually occur at work at the most inopportune times. I still get embarrassed, but I am learning to just say something funny instead of trying to ignore the fact that an intense red flush is creeping up my neck and face. Great points, especially to be kind and gentle to yourself. I’m not there yet but the ever growing menopot across my middle is increasing. And the whole no sleep thing. I’m trying not to beat myself up! Of all the changes, being kind to myself has been the toughest… or the no sleep thing. No maybe its the spreading middle. No, definitively being kind. Being kind to ourselves seems to be something we all struggle with! Although the no sleep thing is definitely a challenge. I’m writing this in the middle of the night right now! Thank God for the internet! Thank you! All of this! Safety in numbers – thank you for making me stop feeling like it is only happening to me. I too sailed through menopause but now have to work very hard to stay on top of the late symptoms I am getting at 61. Exercise and lots of raw fresh vegetable juice helps me.